After a lulling boat ride from Southbank to Gem Pier, and an architecturally inspiring walk around Williamstown's foreshore, it was time to top off a fine morning with a fitting lunch. When we'd first disembarked, a bakery had caught my eye and pies were on my mind, but the hour's walk in the sun meant something more summery was in order. La Dolce Vita, with its shaded rear courtyard, tempting cake display in the window, and a promising Italian-inspired menu, looked like it fit the bill nicely. Should have gone the pie, frankly! I settled fairly easily on a roast chicken panini with rocket and tomato chutney. My dining partner had been lured by the promise of quiche and salad: it still met the bakery cravings, but was also appropriate to the heat. But alas, no more quiche was available (it was about 1pm on a Monday). Multiple specials boards were dotted about the restaurant and while the one in the window proclaimed a primavera style as the risotto of the day, our at-table insert offered only seafood, not what we were after at all. Rightio then, perhaps another of the chicken paninis, but could this one be without tomato chutney? Astonishingly, no, the paninis come pre-prepared. Now even my easily-met order didn't seem such a good choice. What on earth is a cafe doing, charging $11.50 for a panini they haven't made themselves? Unfortunately we had a boat to catch, and didn't want to use more time choosing another venue, so my dining partner went for Choice #4, lasagne. That they could do. The food came in good time, but wasn't overly impressive. 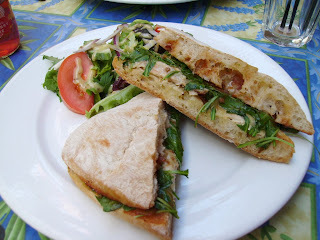 The ciabatta (above) was OK, though very floury and the chicken was too dry. The tomato chutney was a nice addition, however, and the accompanying salad had a light but flavoursome dressing. 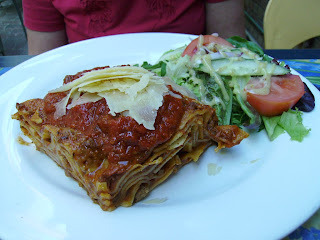 The lasagne looked very appetising and proved to be filling without being too heavy on the mince. The flavours, however, were also a little subdued. The cafe stocks a large range of bottled drinks at around $3.50 each, including various carbonated drinks from Phoenix. It was all a bit surprising really: on spec the restaurant had appealed on all the right levels and certainly it kept its atmosphere while we there. Unfortunately, however, the food didn't live up to expectation. I can't believe a cafe can't make its own paninis! Some bread, some fillings and a sandwich press - it's not rocket science. Do they make any of their food onsite? I know, it had me pretty incredulous. If they're not making their own sandwiches then it does make you wonder at the provenance of their main dishes as well. Quite surprising!!! this is a fantastic cafe, my family and I have been frequenting this cafe for a long period and havefound the food, service and hospitality to be extremely good. Am astonished by your claim that the paninis are not made on premises. I asked the owner and was informed that not only the paninis but all the food and the delicious cakes are made on premises. Pls seek clarification before making ill informed and baseless comments,for this is a great little cafe with beautiful character and atmosphere. I was just as surprised! 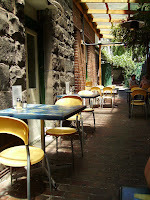 I really liked the atmosphere of the cafe as well. I would certainly have assumed they'd be making their own paninis and wouldn't make unfounded assertions to the contrary. My information came from the waiter who served us, who said they couldn't do one without chutney because they came ready-made. Thanks for the feedback, good to hear that you've had positive experiences there.